Sen. Bob Menendez (D., N.J.) came out against the recently inked Iran deal on Tuesday and said he would vote to reject it, dealing a major blow to the White House, which has been aggressively lobbying key Democrats to support the accord. "I have looked into my own soul and my devotion to principle may once again lead me to an unpopular course, but if Iran is to acquire a nuclear bomb, it will not have my name on it," Menendez said in a major address Tuesday afternoon, according to an advance copy of the text obtained by the Washington Free Beacon. "It is for these reasons that I will vote to disapprove the agreement and, if called upon, would vote to override a veto," Menendez said. 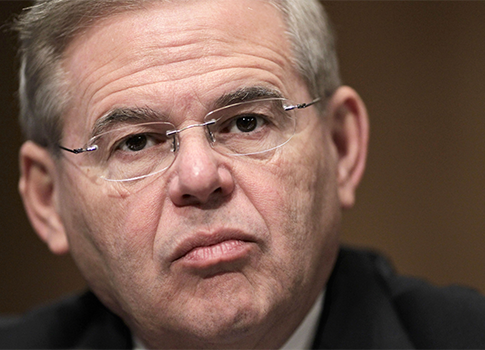 Menendez joins a growing list of Democratic lawmakers expressing opposition to the deal. Sen. Chuck Schumer (D., N.Y.) also has come out against the deal. The senator, who has led the charge to impose harsh economic sanctions on Iran, said the deal would do little to rein in Iran’s nuclear weapons program and went on to lash out at President Barack Obama’s portrayal of the deal. "President Obama continues to erroneously say that this agreement permanently stops Iran from having a nuclear bomb," he said. "Let’s be clear, what the agreement does is to recommit Iran not to pursue a nuclear bomb, a promise they have already violated in the past. It recommits them to the Nuclear Nonproliferation Treaty (NPT), an agreement they have already violated in the past. It commits them to a new Security Council Resolution outlining their obligations, but they have violated those in the past as well." The deal "leaves Iran with the core element of a robust nuclear infrastructure," Menendez said, contradicting remarks by senior Obama administration officials. Menendez also pushed back against Obama’s claim that those who oppose the deal favor war with Iran. "The president and Secretary Kerry have repeatedly said that the choice is between this agreement or war," he said. "I reject that proposition, as have most witnesses, including past and present administration members involved in the Iran nuclear issue, who have testified before the Senate Foreign Relations Committee and who support the deal but reject the binary choice between the agreement or war." After outlining the conditions required for a good deal, Menendez flatly declared that the deal fails to stop Iran from acquiring a nuclear weapon at any time it chooses. "The agreement that has been reached failed to achieve the one thing it set out to achieve—it failed to stop Iran from becoming a nuclear weapons state at a time of its choosing. In fact, it authorizes and supports the very road map Iran will need to arrive at its target," he said. This entry was posted in National Security and tagged Bob Menendez, Iran, Iran Nuclear Deal. Bookmark the permalink.